I have a new Surface Design group started out of the Edmonton Quilter's Guild. We are going to meet the second Friday of the month in each others homes or yards. There are five of us. Our first gathering was earlier this month and we only have three of us this first day. 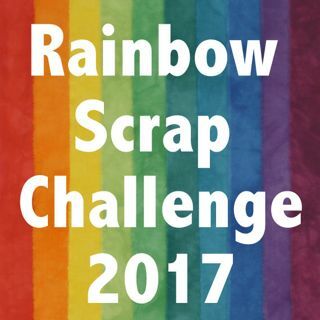 I hope we will have all five next month and talk more about what we are going to do. I really want to meet over the summer months and do some dyeing and painting outside. Here is a couple of the girls dying fabric and taking photos of what we have done. I led the small group in Snow dying fabric in melting snow outside. We do not get much time we can snow dye outside. I did a lot of meters last year this way. It leaves the mess outside. Our outside temp was about 6 C this day. We left our fabric outside for about four hours ( 11 till 3). 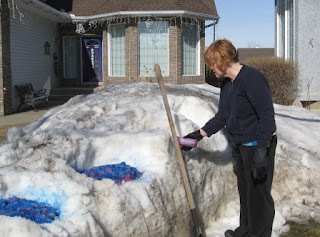 Here is Dawna adding dye to a snow cover piece of fabric. We had large hills of snow, so we made shelves in the snow to place our fabric. We had presoaked the fabric in soda ash. 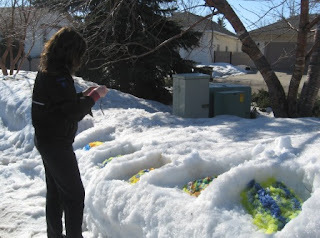 Then we placed a meter of fabric in the snow. We crimped or pleated the fabric. 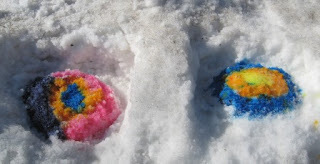 We covered it with snow and then covered it with dyes. Yes I am behind in making blog posts, sorry. I have had the most busy two weeks. I hope to get caught up in what I have been doing. I have much time to rest now. On Friday I had gall bladder surgery so I am not doing much. Time to get some paper work done, play on the computer, and taxes soon. Looks like fun Cathy- Hope that you are feeling okay after your surgery- Wishing you an easy and speedy recovery.